Please note that the following text is based on our experience of INDOOR cultivation! The light also impacts the plants at an angle and not from above, as with horizontal systems. This makes the plants better illuminated and they grow not only in the upper part of the stem, but also in the illuminated lower stem of the plant. Vertical systems are more accessible for plant control and subsequent maintenance. They also occupy a smaller floor area, but they provide up to several times larger growing areas. Plants are not allowed to grow as long as they do in horizontal systems, making harvests more frequent. 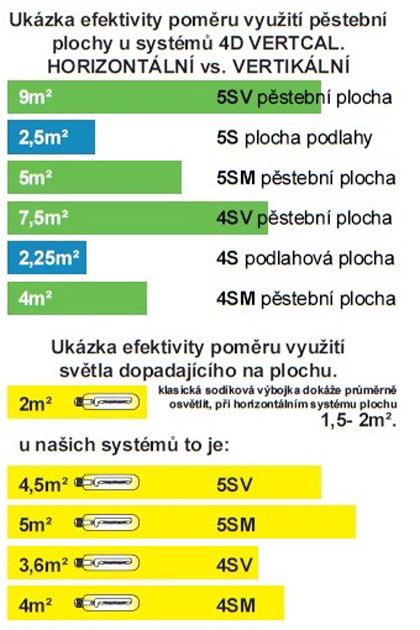 Horizontal systems have higher luminous losses. It is necessary to use different types of reflections ( uneffectively) to help reduce these losses. When growing on so-called tables there is very poor access to the plants at the centre of the table and it is very time consuming their maintenance and on the other hand, the plants at the edges of the tables are smaller due to a lesser supply of light to them. When growing in individual boxes, a much larger growing area is needed to move the plants. You do not have a clear overview of what is happening with roots. There are various mould, algae, and flies. Plants can simply flood or not have enough of water, causing them to suffer. Also, there is a lot of waste and mess in every planting and harvest. Each plant consumes a different amount of nutrient solutions and this creates a chaos of how much nutrient solutions is needed for each plant. This gives rise to a time-consuming maintenance task (especially for a large number of plants). Indoor growing substrates increase the moisture in the room which aids the growth of pests and moulds. Substrates are not suitable for growing in vertical systems. Flowerpots with soil, nutrient solutions and plants have a high weight which requires a very strong construction of the growing system. And when the flower pot is overflowing, there is a splash of nutrient solution on the plants in the bottom rows. - is impossible to check the status of the root system in so-called cubes or sleepers. Each plant must have a capillary that must be constantly checked (often clogged). - It can only be used once, then it becomes waste, it is very uneconomical and nonecological. It must be rinsed prior to use and also after each harvest, thus creating a considerable time to plant. A root system check can not be done. Its use is particularly suitable for aquaponic systems and growing plants reproducing by roots, such as mint, strawberries and others. Probably the only way to grow ginger in hydroponics. When properly used, they are capable of high production. 5.) Round pipes - poor access and root system control when the roots are united can not get into the system at all to check the roots, also cleaning and washing inside the pipe is difficult. Reduced water flow over the surface of the pipe (water flows in the middle of the groove) they have little room for the development of the root system at the beginning of planting. 6.) Flat bottom piping - square - bad access and control of roots in the system. When the roots are joined, it is impossible to get into the system at all, to root control (root mold, roots must be constantly white). Further cleaning and washing inside the duct are difficult. Also, the water distribution is not uniform across the entire surface of the duct. So it flows along the edges of the vessel, so the roots have little space for the development of the root system. Basically, any piping without a removable lid is inappropriate for hydroponics. It is of great benefit to check the status of the root system. These systems require the use of nonwovens and Rockwool cubes and they need to be constantly changed after each harvest. This generates unwanted waste and increases operating costs. These systems also occupy a larger area for maintenance. - The main disadvantage is the daily need to check the nozzles due to blockage or poor pressure distribution from the pump in the manifold when the nozzles close to the pump are spraying more and the nozzles which are further spraying less and are more often blocked. - the majority of aero. systems do not have enough height for downward root growth, and the system changes on the NFT system as soon as they touch the bottom of the vessel. It becomes a combined system. - when used properly, this is the most effective and therefore the most economical way to grows herbs indoors.